Attention Shoppers: It’s the Friends of the Library Book Sale! Book lovers, shoppers, and library fans, get ready, because it’s our favorite time of the year: the semi-annual Friends of the Library book sale! This year, the sale opens on Wednesday, October 31, for Friends of the Pickerington Public Library members. Even if you’re not a member of the Friends on the 31st, you can join at the door to take advantage of their members-only preview sale! The sale opens to the public on November 1, and continues through November 4. Add to your collection of books, DVDs, music, and more! Are you a teacher looking to add to your classroom library? A collector searching for an elusive book? A crafter in search of art books and illustrations to inspire you? Or just a bargain hunter who knows a great deal when you see one? This is the special event you need! 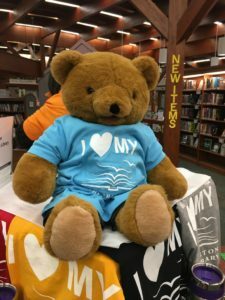 You can also stock up on Friends of the Library merchandise, like t-shirts and coffee tumblers (because what goes better with books than coffee)! Wear your love for the library on your sleeve. Remember: when you shop, you support the Friends – and when you support the Friends, you support your library, too! Next Post →Give Back with the 29-Hour Give!